Katrina's Kreative Heart: Christmas is in the Air! Hi all. I hope everyone is recovered from their turkey coma. I finally have and now I have my house filled with the Christmas spirit. I finally got my tree up Sunday and all of the inside decorations too. All that’s left is the outside and I will be done with that. I still have to finish my Christmas shopping but I did get a good start on that too awhile back I really hoping I am going to have my first “stress free” Christmas?? I hope anyway. I am usually running around like a chicken Christmas week trying to finish up the Christmas shopping, and this year I made myself get an early start. I had my great niece and nephews all done before Halloween! And now I just pick away at someone every week or two. I will let you know after Christmas how that works out for me. Anyway, I have a cute Christmas card to share with you that I put together. I am really happy with how this card came together. I started with a left over card “kit” that I had cut for a class last year! I challenged myself to pull out left over kits and make something out of them. I have several different kits from several different classes that are just sitting there waiting for something to be done with them, hence my challenge to myself and this is what I came up with. 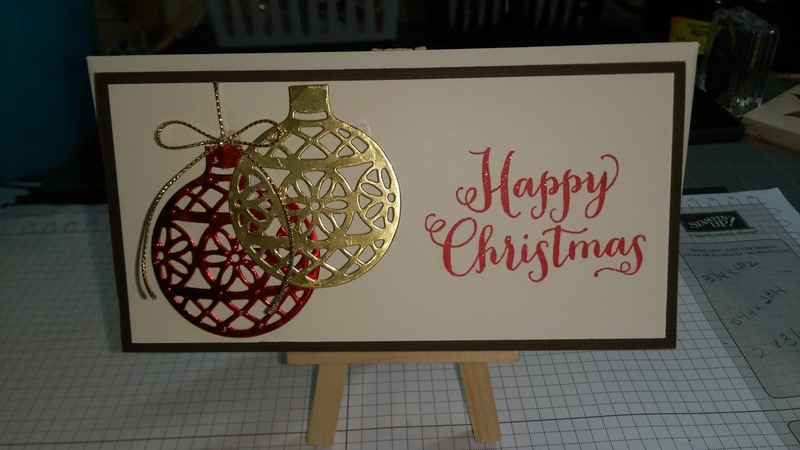 I started with a piece of Early Espresso cut at 6”x6” scored at 3” for the card base, I then stamped Happy Christmas from the Oh What Fun stamp set in the lower right hand corner of a Very Vanilla piece cut to 2 ¾”x 5 ¾” using Real Red ink. 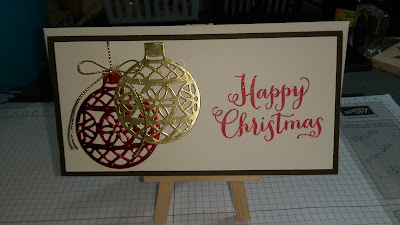 I cut 2 of the small round ornaments from the Delicate Ornament Thinlits dies in the Holiday Mini catalog and I used the new Precision Plate, one from gold foil paper and one from Real Red foil paper and adhered them to the left side of the card using the new Fine Tip Glue pen also from the Holiday Mini catalog. I tucked a piece of gold cording behind the Very Vanilla and strung it to the red ornament and added a bow from the cording to it using a glue dot. I adhered a second piece of Very Vanilla card stock cut to 3”x5 ¾” inside the card base and then I made a matching envelope from the Neutrals Envelope paper from the Annual catalog using the envelope punch board. My paper was cut 7 5/8” square and I made the first score and punch at 2 ¾”. Thanks so much for stopping by, I truly appreciate you taking the time to spend with me here. Please let me know what you think of the card by leaving a comment down below. New Occasions Catalog Sneak Peak!